In an article by Eleanor Duse, she mentioned dogs usually like water. Som­e breeds, like Labrador retrievers, are traditional boat dogs. But that doesn't mean you can take them on boats without considering their safety and well-being. Many dog owners assume their pets can swim, but a short doggy paddle in the pond is a far cry from swimming through strong currents in open waters. 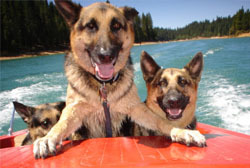 Your dog may not be strong enough or fast enough to swim alongside your boat. Leaner dogs may struggle more, since fat is more buoyant than muscle. Short-legged breeds can also have problems swimming. Make sure your dog is securely leashed when you first get on board. The other end of the leash should be in your hand, not tied to the boat. The dog should know you're in control and that you're close by. Once you've made all the necessary preparations for departure from the dock, you can reward your dog with a swim. Food and water. Bring more water than you think you'll need, just in case. Chances are that you and your dog will be out in the sun more than either one of you is used to. Newspapers or a doggie toilet. This clearly represents hours of training, frustration and mess. Your dog probably won't get it right every time. You already know your dog's warning signs, so accompany it as you would on a walk and clean up any messes. Doggie snacks. You should always have treats handy to reward your dog's good behavior. A carrier, harness or leash. Even at a dock, you have to comply with local leash laws. Transportation. You'll need an easy way to help your dog get out of the water and on board -- either a dog ladder or a dog ramp. Proper paperwork. You'll need up-to-date papers and vaccination records, especially if you plan to cross state or national borders.